Worth to go!! Bring your own ticket with you as there are interaction port around the museum and you get to see your score at the end. 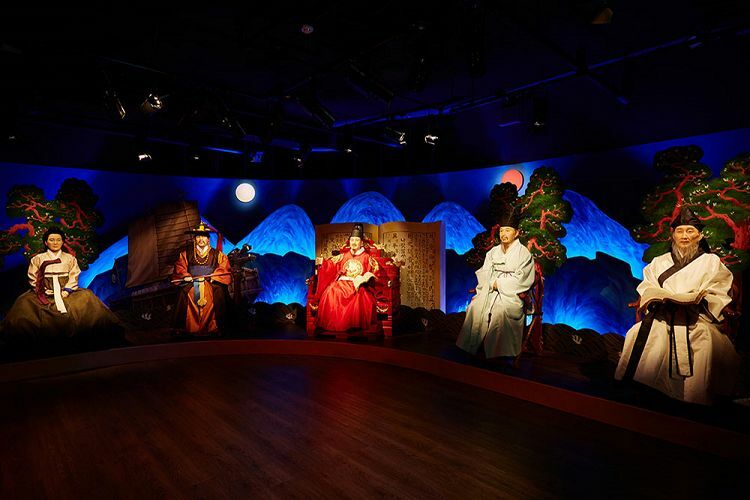 Grevin Museum is a world-class wax museum where you can meet and take pictures of wax figures look just like famous people from all over the world. It takes a great effort to fully reproduce all the details of a person taking 150 hours of manufacturing and carving just to try to express every detail. From natural hair to 190 hours of makeup, Grevin Museum has earned its name of a world-class wax museum. Do not miss the great opportunity to leave good memories with wax figures of world-renowned celebrities! This room is a special photo booth where you can enjoy Andy Warhol’s pop art contents. Experience elegance and glamour with beauty icons from various generations and nationalities, such as Audrey Hepburn or Paris Hilton, etc. Mirrors on both sides, camera, and information screen of the dressing table combine faces of you and beauty icons. Enjoy being a celebrity in Beauty Salon. You can play a music quiz listening to music of world-renowned musicians. Recreate the scene of recording studio of world-class musicians. Best venue for music fans. Figure skating queen Kim Yu-na, South Korea’s first major leaguer Park Chan-ho… Meet top athletes from different sports sector. Why don’t you have a basketball game with your friends and be Michael Jordan! Explore & discover the secret of the making process in digitals. Make your own figures by 3D scanning camera fixing hairs and clothes for yourself. Get the figure through a video and send it to you via email. Presidential Aircraft has recreated the actual engine compartment. Enjoy the flight simulation game played in large screen. Kids love this game since the background video changes with the control of the player and the sound is based on recordings from real airports and airplanes adding vividness. You can enjoy various quizzes related to IT and science with Steve Jobs, the founder of Apple with innovative ideas and artistic sense, and Einstein, a father of the theory of relativity, through table PC installed at the desk. Scenes of the famous Hollywood movies are screening lively in front of you! Play a roulette game like a scene from Ocean’s 13. Four people can participate at the same time. Try your luck! A great opportunity to meet Hallyu stars! Find special goods, such as the original and recreated world-class arts goods only can be seen at Grevin and cute character goods at Shop Grevin! Q. Are there any storages? A. Yes. You can store bulky belongings at storages for free.